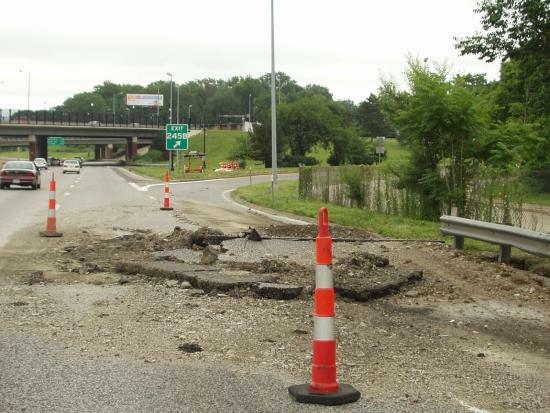 MoDOT is asking motorists to avoid eastbound I-70 between Shreve and west Florissant as crews repair the road where an MSD sewer line ruptured on Sunday. The Missouri Department of Transportation is urging motorists to avoid eastbound Interstate 70 between Shreve and west Florissant Monday as repairs continue on a ruptured sewer line. Deanna Venker, MoDOT area engineer for St. Louis City, says crews worked overnight to fix the sewer line. Concrete is curing and crews are working on road repairs. "As the rain gets heavier, we're going have to stop work," said Venker. "If it continues to be light, we can continue with repairs. If everything was great, with no weather problems, it would probably take us about 24 hours." The Metropolitan Sewer District line ruptured around 3 a.m. Sunday morning, just after a torrential downpour. Motorists can detour southbound I-170 to eastbound I-64 or use alternate routes. For travel information, visit www.modot.org. Thunderstorms hit the St. Louis area around 3 a.m Monday, knocking out electrical power to thousands of residents. Ben Miller, meteorologist with the National Weather Service, says the storms were severe in some areas. "Widespread 60-80 mph winds, with a lot of trees and tree limbs down, power lines down, power outages." said Miller. At about 5:30 a.m. Ameren Missouri reported more than 39,000 customers were without power, nearly 25,000 of them in St. Louis County. A Missouri House Committee is convening in Joplin, Mo. as it examines the state's disaster response efforts. The House Interim Committee on Disaster Recovery is meeting Monday afternoon at the campus of Missouri Southern State University. The school served as a staging area for some response efforts after a deadly tornado destroyed a large part of Joplin last month. Committee Chairman Shane Schoeller says he wants to hear from residents about issues they have faced in responding to and rebuilding from the tornado. The committee met last week in Sedalia, which also was hit by a tornado. The panel is to meet Thursday in Sikeston, near where flooding occurred. It also has added a July meeting in St. Louis, which was struck by a tornado earlier this year.